You bought your parents / grandparents / other relatives a new computer, set it up, and showed them all of its nifty new features. You’ve gone home, knowing that you’ve made them very happy. But, deep down, you know that this isn’t the end of the story. It’s not going to be long before that dreaded call comes in asking for support. “I can’t find the draft of the email I started!” “Why can’t I make a Skype call?” “My speaker / mouse / keyboard isn’t working!” They’re going to want you to come over as soon as possible to fix the problem or to talk them through a fix, and both of those activities are probably going to take several hours out of your day. But there is a solution. 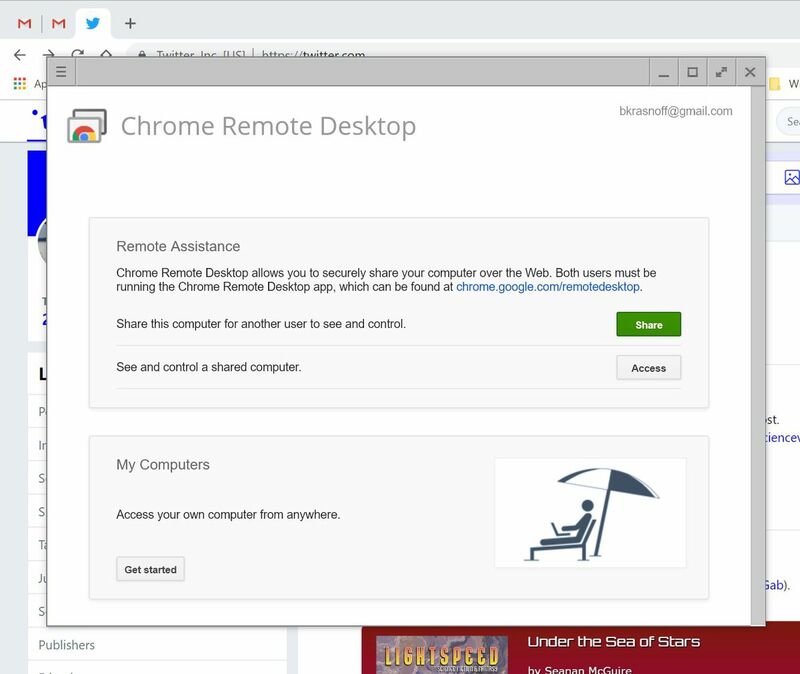 If both you and your troubled relative use the Chrome browser (or own a Chromebook), you can use the Chrome Remote app to easily gain temporary control of their computer to either fix the issue or show them what to do. It’s available for PCs, Macs, Linux systems, and Chromebooks; there are also separate apps for iOS and Android. When they click on the green “Share” button, they will get a 12-digit randomly generated numerical code. That’s your cue to click on the “Access” button. 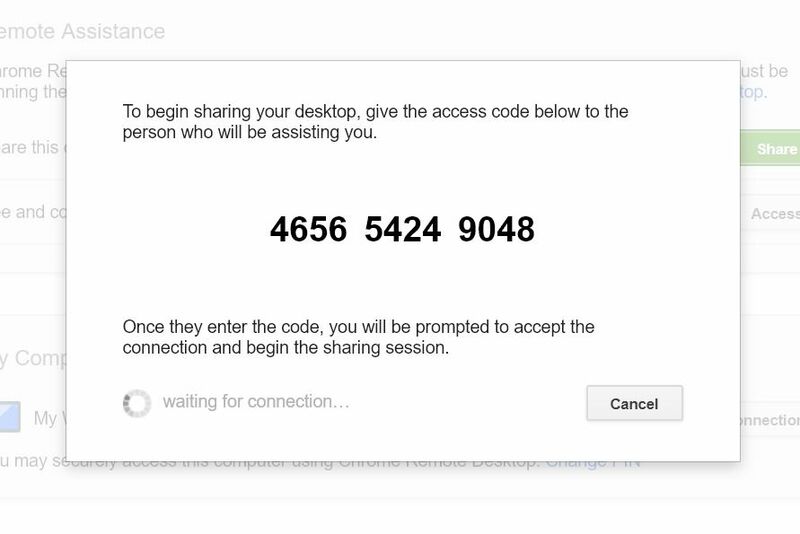 Have your friend or relative call or text you the code, and type it into the pop-up box. The other person will get a box that asks “Would you like to allow [email address] to see and control your computer?” They have the choice to Share or Cancel. Assuming they’ve selected Share, you will now have control of their computer. The other person never loses control, but you can do anything they can from your computer, including showing them how to set up Skype or finding the email they accidentally deleted. As long as the screen is being shared, there will be a small box reminding both you and the other person of that fact. And after a few minutes, there will be a “timeout” warning on the client system, which will have to be clicked on or the connection will be lost. This is a safety feature, although it can become irritating if you’re in for a long session. There is a way around that, but it will only work in some cases. Remember that “Access your own computer from anywhere link” on the first Remote Desktop window? Click on that “Get started” button. You’ll be asked to enable remote connections and to provide a PIN for security. Once that’s done, you can then use Remote Desktop from another computer by simply going to Remote Access, finding the system on the list of My Computers, clicking on it, and entering the PIN. Then, there will be no timeouts. However, there is one major caveat: you must be using the same Google account on both systems. The mobile versions of Chrome Remote Desktop also work fairly smoothly once you’ve downloaded the appropriate app. However, keep in mind that you will not be able to see the entire client screen on your phone; you will have to scroll around the display, which may make things a bit difficult. Admittedly, the interface for Remote Desktop could be better. Google may finally be getting that message — there is apparently a beta version in the works — but for now, the above directions are the best way to go. Chrome Remote Desktop isn’t the only remote access software available. For example, Windows has its own Remote Desktop app, and Macs offer a Screen Sharing feature. There are also a number of other apps out there. 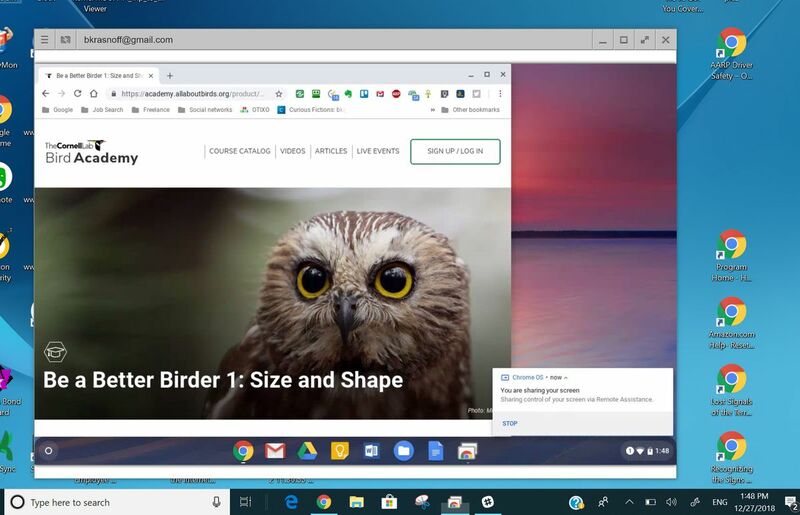 However, Chrome Remote Desktop makes it simple for people to share screens cross-platform with very little effort.